Shinji Kimura is among Japan’s foremost background artists, having worked with both traditional paint & brush media as well as in the latest 3D digital environments. 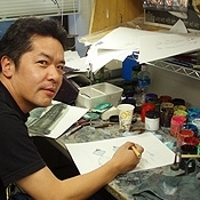 Shinji Kimura’s amazing backgrounds have helped bring the unique and unforgettable atmospheres to famous anime such as Hayao Miyazaki’s “My Neighbor Totoro”, Katsuhiro Otomo’s “Akira”, Mamoru Oshii’s “Angel’s Egg”, Rumiko Takahashi’s “Urusei Yatsura: Remember My Love”, and many others. His credits include over 25 different series in various positions as art director, storyboard artist, character designer, and background artist.